David Hubbard is a Revenue Growth Expert, a pragmatic Marketing and Sales Consultant, a proven business leader and the CEO of Marketing Outfield. He has helped both private and public companies grow by 25-50% per year by properly enhancing their revenue strategy, sales and marketing activities, and incentive compensation plans to better align the company with their target market buyers. With a unique executive and consultant track record within and across the Marketing, Product Management and Sales functions, he brings a frank and unbiased perspective to his clients. In this interview, David talks about his vast background in marketing and sales and how he leveraged that experience to form Marketing Outfield. We see that the success of every company (when it comes to revenue growth) is through alignment with the ideal customer before starting to market. Whether you're sitting in New York or Peoria, the first thing to do is understand the local resources available to entrepreneurs that can help you become educated, to create a realistic plan, and to successfully launch your company. Can you tell us a little bit about yourself, David and how you got the idea for marketing Outfield? I went from being a B2B customer to becoming the chief marketing officer and/or the chief sales officer at multiple private and public B2B vendor companies. I began my career as a professional engineer in Canada responsible for computer systems in existing and future power plants. After a few years, the engineer became a high technology sales representative at a multi-billion dollar company, and a few years later, a field marketing manager. With the benefit of excellent skill development from my employers, and multiple business successes from my newly discovered intrapreneurial spirit, I criss-crossed up the latter between Marketing, Product Management, and Sales to ultimately become the company leader of those functions in several companies. As I later criss-crossed between company executive and revenue consultant, I had the opportunities to explore my entrepreneurial curiosity by securing investors, advising startups, and ultimately, leading a venture backed startup. Entrepreneurs need to set realistic goals, learn from failures, and continue to become the successful person they want to become. I love helping companies drive accelerated revenue and profit, and wanted to do it more often, so I created a Marketing and Sales consulting business. Entrepreneurs should select a company name that is meaningful, unique, and can weather the test of time. I picked Marketing Outfield to help me communicate that this consulting company was different from the typical "Marketing" firm. We deliver a customized solution to our customer's revenue growth problem. Based upon my experience as an executive and as a consultant, the most common reason for lackluster growth is lack of alignment. Customers are changing faster than companies can adapt, so they are losing alignment with their customer. Due to the internet, mobile access and social media, customers are changing their purchasing process as fast as technology changes occur. Marketing, Sales, and Product Management are doing their "Silo-best" to respond to this changing market, but they are doing it within the departmental and functional silos, not across them, causing the company poor customer experience. Marketing Outfield has deep experience working within each of those silos and has been successful bridging across them. We can therefore come into a business, quickly identify their top 3 barriers preventing revenue acceleration, develop a customized strategy and action plan, and help lead their execution to ensure revenue growth increases. In contrast, the typical management consulting firm brings in a team of newly minted MBA grads, presents a ton of PowerPoint slides, and either leaves it to the company to figure it out, or participates in a "re-engineering journey through he'll and back". Or, the typical Marketing consultant or Sales consultant will execute their "latest shiny object" distraction.... like another new sales methodology or marketing automation approach... which is simply a tactic, not a solution. Entrepreneurs need to align with their ideal customer first, and ensure they have product market fit, before trying to market or sell their wares. Trying to grow with the wrong product is a recipe for financial failure. We have very tight criteria for our ideal target market and our ideal target customer. I love working with company leaders who want their company to become a top performer, have come to the conclusion that implementing the latest "shiny object" tactics are not working, and are ready to bring in someone who can deliver a series of customized quick fixes in partnership with company leadership to deliver both short and long term revenue growth benefit. I realized early on that I was terrible at life and work balance, so my loved ones, particularly my spouse, play a critical role in helping me achieve balance. Like most passionate entrepreneurs, I can become totally absorbed in my work and easily lose track of time. So whenever a loved one calls, I immediately try to make them my top priority. If they have a suggestion for getting together, I try to make it work or suggest something different, but never say no. I also try to proactively schedule time in my calendar to call or email loved ones regularly, and look for opportunities where we can spend quality time together. Entrepreneurs need to realize how important work and life balance is to their personal performance. There's always too much to do, but success means doing the right things in the right ways. My best advice to entrepreneurs is to maintain only one calendar for all work and life activities, and it review weekly to ensure there is a healthy balance for work, for loved ones, and for yourself. I am passionate about the work I choose, confident in my ability to make a real difference, and somehow have a never-ending drive to take calculated risks with my career to become the best I can be as an individual and leader. I've made many mistakes, but try my best to never make the same mistake more than once. I literally came from the poor side of town but decided I could do better. I put myself through a 5 year university degree program becoming the first in our extended family to get any degree. I didn't know what I wanted to do and had zero exposure to business until I graduated, moved 2000 miles away, and began my professional career. A few short years later, I decided that I wanted to be a General Manager responsible for managing a multi-functional group and accountable for profit and lost. I was willing to relocate throughout Canada and USA to achieve that vision, which I did. We are only as good as the people we surround ourselves with. Along the way, at each stage and at every critical decision point and before every relocation, I was able to seek the advice from my closest friends, who were some of the best business professionals and executives I have the honor to work with. Every leader, every entrepreneur, every dedicated professional needs to find trusted advisors to help them in each stage of their life. We cannot be successful without the willing help from close colleagues and friends. Of course, every one in business has had to deal with the reality of that situation. Maybe it's because I was once a disappointed customer, or maybe it was my training and experience that I received, but customers come first. I encourage customers to speak frankly about the service we provide. I see it as an opportunity to discover how we can deliver better service. If we could have done better in the given situation, I apologize to the customer and assure them by my actions, not just my words, that their concerns matter. If I believe the customer's expectations are unreasonable, I try to figure out why, and I do my best to reset their expectations (or mine) so we can get back on the same page. When dealing with customers, entrepreneurs need to become their trusted advisor, be their partner, and collaborate with them to assure their success (and your own), by fostering mutual trust and respect. 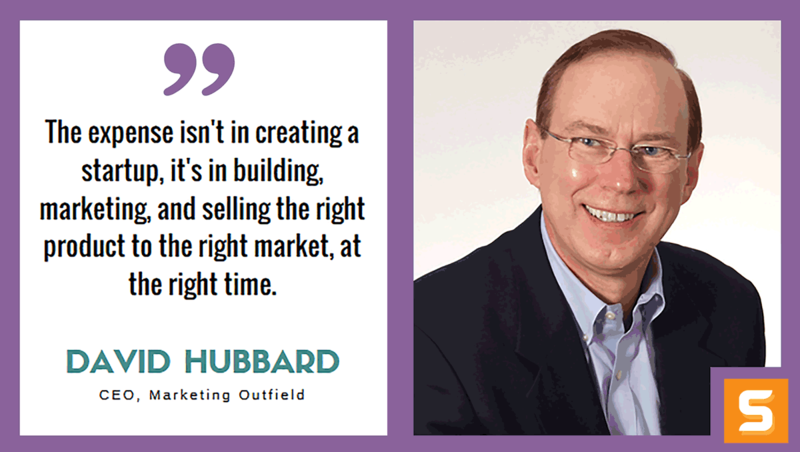 How did you find the time and money to get Marketing Outfield off the ground? Any advice for entrepreneurs with minimal time or resources? Setting up a business is much easier than it ever was. Software As A Service, Platform As A Service, and other technologies have made it inexpensive and effective to buy versus build, and to manage a virtual team of outsourced specialists. Highly skilled contractors are much easier to find, engage, and manage, allowing companies to in-house only the critical skills they need, and outsource the rest. The expense isn't in creating a startup, it's in building, marketing, and selling the right product to the right market, at the right time. Don't make the same mistakes as your predecessors, learn from them. Don't jump into the deep end of the pool until you have confirmed that there is a real market for your product, that there are identified prospects that you have personally talked to who are willing to actually buy it from you if you built it, that you understand exactly what it will take to build it, and that you have a realistic plan to do so before running out of money. Build an advisory team who can help fill in your experience gaps regarding product definition, marketing and sales. Then, and only then, raise some money from friends and family to get to the next stage. Is there a type of marketing that has worked amazingly for Marketing Outfield? If so, how did you stumble upon it? There's myriad marketing and sales strategies to choose from, and fortunately, we're very familiar with most of them. Each one can add value in the right situation. However, to accelerate profitable growth, you need to integrate the right set of strategies in the right way. Even if we are 100% confident of the right approach for a particular client, we do the minimum amount of work to test the strategy in our client's market, and confirm it's delivering compelling ROI, before we optimize and scale it. Our initial goal is to optimize and scale 3 strategies with superior ROI. We did the same for our own business. One of the strategies that has worked best for us is a combination of thought leadership, content marketing and social selling. Currently, most of our prospects have contacted us proactively as a result of this strategy. We pride ourselves in having deep knowledge and experience about effective Marketing, Sales, and Product Management strategies and tactics. However, in just a few short years, an industry of 5000 martech, salestech and adtech vendors has sprung up with updated solutions and approaches. The amount of content related to the marketplace has ballooned even faster, making it difficult to find the nuggets within the storm of fluff. Frankly, we were struggling to keep up and it was becoming a bigger and bigger distraction for us. When we jumped into social media marketing and social selling, we quickly discovered subject matter experts in Account Based Marketing, Sales Enablement, Social Selling, Marketing Automation, Sales Development training, Product Management principles, Leadership Development, and more. We engaged like-minded experts and eventually built a personal network of experts to share market insights and client experience. It really helped us spend less time maintaining professional knowledge and insight, and more time applying our expertise to implementing client solutions. To increase productivity and entrepreneurial success, leverage the expertise of other entrepreneurs, market experts, and subject matter expertise. Build a social network, a personal advisory group, a company board of advisors, or a customer council where appropriate. Steve Jobs, not because of who he was as a person, but because he successfully challenged the status quo and changed industries. As he continued to run a successful computer business, he disrupted the music industry with iPod, then the mobile phone market with iPhone and iPad, and then the applications market with iTunes. Yet each of his moves fully leveraged the expertise developed in prior products. What made the real difference as an entrepreneur was that he personally ensured there was product market fit, he took time to understand his target customers, and he evolved his Marketing and Sales approach to best reach his evolving target market. A true entrepreneur, who created and maintained profitable, sustainable business initiatives. What are the top 3 pieces of advice that you would give someone starting a business in New York? What do they need to know from the beginning? Marketing Outfield is headquartered in New York but has delivered services to clients throughout US and Canada, as well as to companies headquartered in Europe who are trying to break into the US market. Whether you're sitting in New York or Peoria, the first thing to do is understand the local resources available to entrepreneurs that can help you become educated, to create a realistic plan, and to successfully launch your company. There are a lot more resources than you think! Don't try to do it alone. Surround yourself with people whose experience can increase your chances of entrepreneurial success. Don't let the fear of "not having enough money" cause you to do the wrong things. If you don't know how to ensure product market fit or how to pick the right initial customers or how to scale from 3 customers to 30 customers, find someone that does. Don't waste your precious time betting the company's future on critical expertise that you do not possess. Startups are risky enough, so don't make them riskier by trying to do everything yourself. For daily updates on how to grow your company, connect and follow David on Twitter, LinkedIn or LinkedIn.